Experience Swann's innovative thermal-sensing motion detection technology with the SWNK-885804. Swanns True Detect PIR Thermal-Sensing technology detects motion by heat, such as from people & cars, to trigger recording and push notifications. This cutting-edge technology virtually eliminates false triggers, like plants moving with the wind, to only capture events with security relevance. Plus, get amazing detail with 4K Ultra HD which is 4x the resolution of 1080p Full HD. Zoom in closer with unprecedented clarity to essential evidence such as license plates, facial features and clothing details. Now its even easier to see whats happening using voice commands via the Google Assistant (using your Smartphone or Google Home) and your Chromecast device. You can customize commands such as Ok google, show me the front door and then stream video from the cameras to your smart TV. 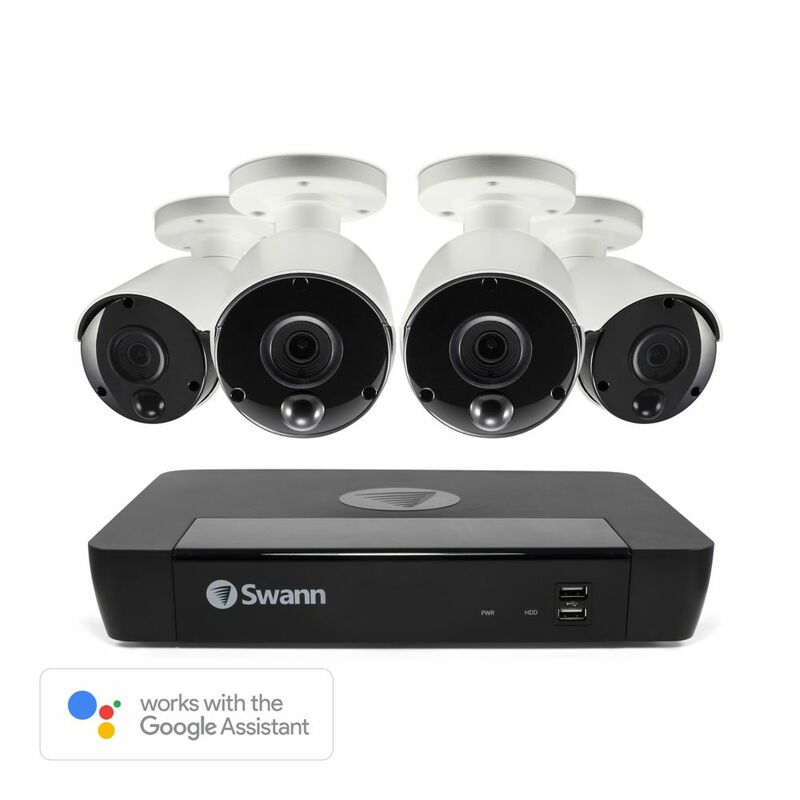 8 Channel 4K 2TB NVR Security System with 4 Outdoor Thermal-Sensing Bullet Cameras Experience Swann's innovative thermal-sensing motion detection technology with the SWNK-885804. Swanns True Detect PIR Thermal-Sensing technology detects motion by heat, such as from people & cars, to trigger recording and push notifications. This cutting-edge technology virtually eliminates false triggers, like plants moving with the wind, to only capture events with security relevance. Plus, get amazing detail with 4K Ultra HD which is 4x the resolution of 1080p Full HD. Zoom in closer with unprecedented clarity to essential evidence such as license plates, facial features and clothing details. Now its even easier to see whats happening using voice commands via the Google Assistant (using your Smartphone or Google Home) and your Chromecast device. You can customize commands such as Ok google, show me the front door and then stream video from the cameras to your smart TV. 8 Channel 4K 2TB NVR Security System with 4 Outdoor Thermal-Sensing Bullet Cameras is rated 4.4 out of 5 by 54. Rated 5 out of 5 by Richard s. from Great product Easy to install, all hardware included, easy setup, I was up and running within 15 minutes. App works great, really happy with the purchase. Gonna get 2 more cameras. Rated 5 out of 5 by Dave from Great system I found the Cat5e wiring was too flimsy and was not sure if it was UV protected. I bought 500' of cable and connectors and installed the cams. These new connectors use all 8 wires for future updates compared to the cable in the box using 3 wires. They work awesome. Just wish they had a wider angle other than 93d. Operating instructions are confusing with over 100 pages. Rated 5 out of 5 by Steve Jones from Love this POE system POE cameras are the way to go. System was easy to install, though I did have to make up 4 Ethernet cables of my own since those in the box are only 60 ' and I had 4 cameras that needed longer. One installed, I downloaded the Homesafe app and my DVR was immediately detected. No complaints thus far.